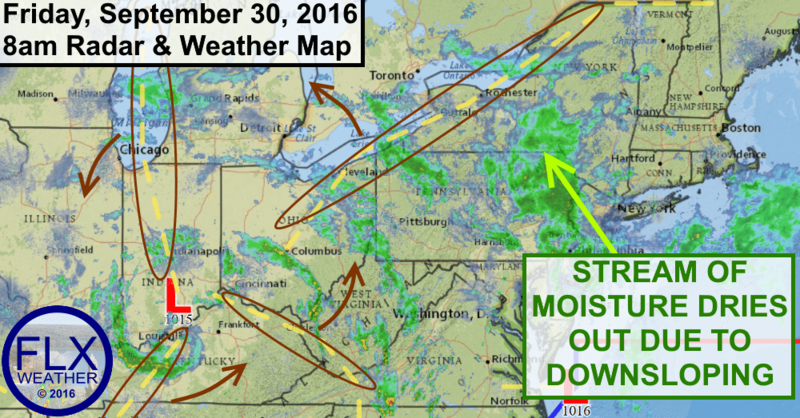 A stream of moisture from the Atlantic is pumping rain into New Jersey and eastern Pennsylvania. This stream of rain is pointed right at the Finger Lakes, yet our weather today should be a bit showery at best with very low amounts of rain. Unfortunately, our region is falling victim to a downsloping effect that is preventing rain from reaching our area. This is the same phenomenon that is responsible for the semi-arid climate across much of the western United States. As moisture rich air from the ocean moves inland, it is forced upward by rising elevations- in this case, the Poconos of eastern Pennsylvania. As the air rises, it cools. Cooler air cannot hold as much moisture, so the moisture falls out as rain.